I was busy searching for a blog topic when I was accidentally read this post, "I WOULD RATHER GO HUNGRY THAN EAT FILIPINO STREET FOOD AGAIN". Seriously, I was fascinated with her blog post and coming from a foreign point of view about Filipino street food is not new to me. Heard a lot of these kind of reaction and impression and that's okay because we have different cultures, beliefs and taste for food as well! But for us Filipino's we do love street food, don't we? When we say STREET FOODS we really mean food sell in the street. 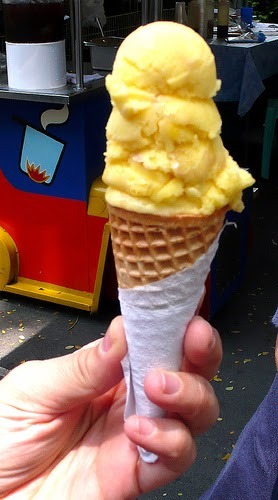 It was said from a blog ytravelblog, that the foundation of any strong culinary heritage is the street food. And yes, I agree to that because this is where we inspire tourists to come and visit our country and have a taste of our culture and that includes the FOOD. In with that, we make a name and that name will forever be remembered by any foreign tourists once visited our country. 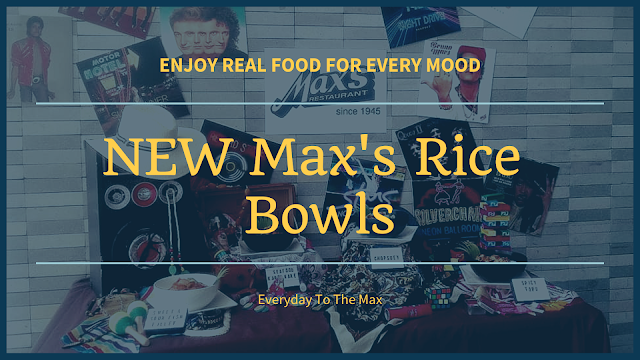 We Filipinos are popular and famous to have a BALUT, PEANUT, Bananacue, Camotecue, Maruya, Ginanggang, Fish Balls, Tempura, Squid Balls, Chicken Balls, KWEK-KWEK and TOKNENENG, TAHO, Dirty Ice Cream, Halo-Halo, Green Mango(manggang hilaw), and barbecue, in the street. 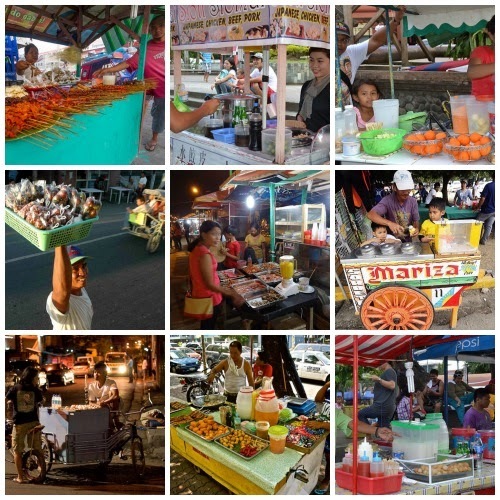 And here in Davao I have a list of my favorite street foods that I'm sure you also love it. Food made with freshest ingredients are cook in front of you. Once you see it was already cook and ready to serve don't eat it. Just be careful though. You really have to be meticulous in eating this kind of a street food, you have to make sure that the intestine is well cleaned, it must be clean inside out, boiled, and grilled or immediately dip in a hot boiling oil with sticks. How to eat? Just dip it in suka or vinegar with onions, pepper, and other spices. Or ketchup either sweet or chili (it's your choice) then you eat it. Is cook in a high temperature to achieve the crispiness of the chicken skin. And when it is cook, you can dip it with vinegar(same as with the isaw). But make sure that the oil use here is not the same oil use the other day(or being use over and over). 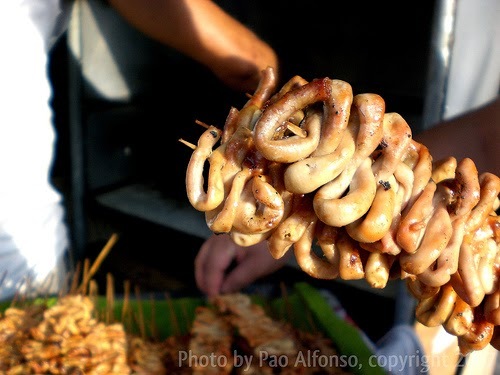 Same with the Isaw, BATICOLON is properly clean, cook marinated together with the spices, then grilled or dip in a hot boiling oil. 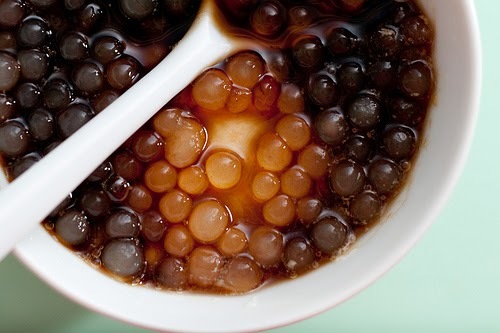 After that, you can dip it with chili sauce or vinegar. 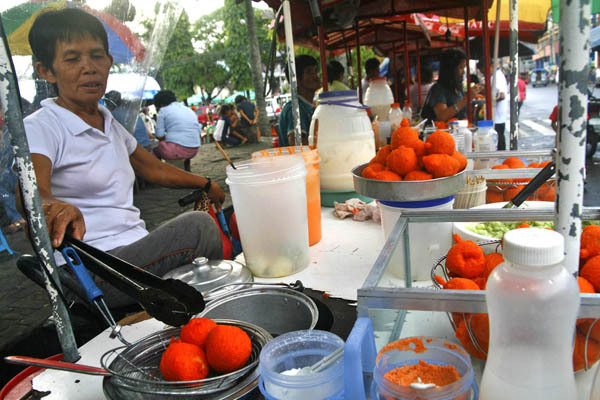 Here in Davao, TOKNENENG is called KWEK-KWEK. Well, this is how they called it here, even if I keep on insisting street vendors that Kwek2 comes from a quail egg and TOKNENENG came from a chicken or a duck egg dipped in an orange batter and deep fried until crispy. But they are used to call it KWEK2. So that's it, KWEK2 or TOKNENENG here are the same. 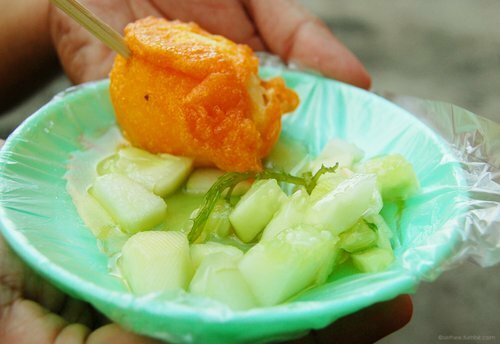 This is how Davao street vendors serve their TOKNENENG(or kwek2), they usually pair it with cucumber and guso seaweed. 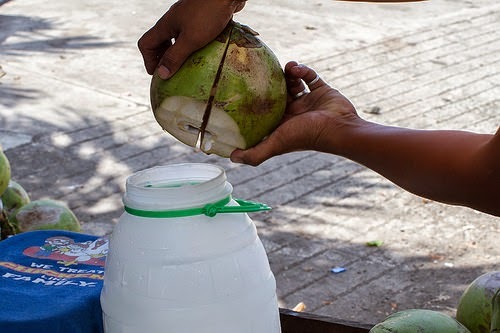 And because Philippines climate is characterized as having a relatively high temperatures and high humidity, people are fond of drinking chilled drinks or cool refreshment the likes of, BUKO JUICE, ICE CANDY, TAHO, DIRTY ICE CREAM. 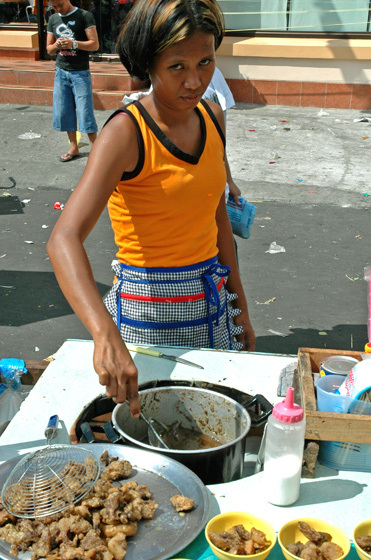 Not to worry, most of the street vendors here in Davao is very careful in preparing their food, because every now and then Davao City Health Officers are checking their places and the food they serve as well. Davao Street Vendors are discipline. They are required to get a health card from the City Health Office and upon getting a card they are examined to make sure they don't have a communicable disease since they are selling food and most of all they are trained for FREE on proper food preparation. That is why I LOVE TO EAT DAVAO STREET FOODS because our street vendors religiously follow the rules & regulations set by our Local Government. Well, I eat street foods once in awhile, just to end my cravings. You should visit Davao now and taste our street foods located at the San Pedro St., Roxas Avenue, Ilustre St., and Bolton Street. Wow, that takes my worry away about street foods. It is commendable that your city health office is serious at ensuring that street foods are safe for public consumption. I hope every LGU would have the same drive. Yes Jayson, I hope so. So that everyone especially the tourist will not say something awful about our street foods. Everything looks delicious! I personally love street food and would definitely try Philippino street food when I visit! Tokneneng, dip in vinegar with cucumber is so heavenly. And those isaw and fishballs, oh my :). Ginanggang is a grilled banana cue. In another bisayan dialect they called it "gisugba nga saba". my ever fave streetfoods are tokneneng, green mango and kikiam. before i buy, I look carefully if the tools and foods are clean. I just hope government requires health card to all street vendors anywhere in the Philippines. I love street food and it has its charm that remains really tasty and delicious. I don't know or I am not aware that because of street foods, Filipinos are known for that. Street foods just come out and become on demand during special occasion in a certain locality here in the country, especially fiesta. Now it is common among municipalities, cities in the country and the street vendors are starting preparing their display 3 in the afternoon till midnight. I hate to admit, although street food is delicious, I wouldn't dare to eat it either. Yes, your advice is valid, to make sure about the oil etc, but as foreigners, we wouldn't be able to tell the difference. I will only dare to eat that if I'm out with a local friend! Street food really is tasty but I don't know. I had ameoba before so I don't want to risk it. I am not a fan of street food. Having OCD it becomes really difficult for me to eat street food. thanks for sharing the post though. street food are actually really tasty. but sometimes we wonder about the healthy or the safety of the quality of the food itself. I don't care if its clean or not, basta street foods Gora ako. Makapunta nga riyan and do treat some isaw Pal. Sure Papaleng! 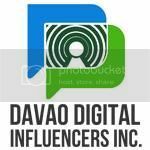 Come visit Davao now! 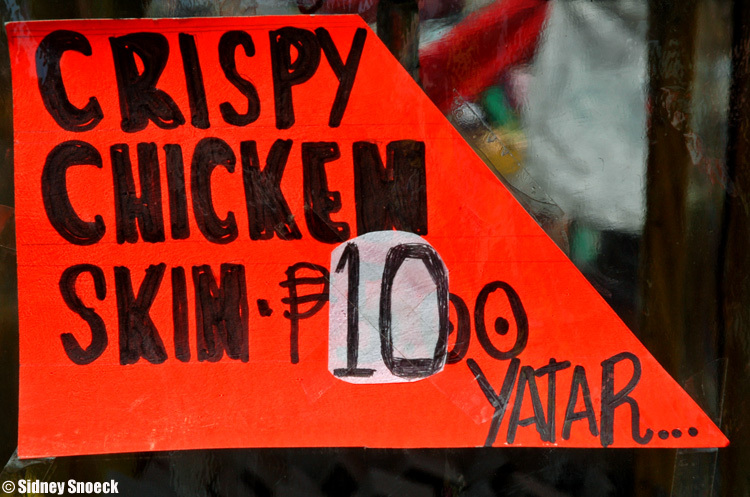 Fried Chicken Skin is fast becoming a popular street food in Manila. Just asking, is there 1 Day old Chick in Davao? fave ko kasi yun. Yes Papaleng but not so popular here in Davao City. Maybe in our nearby provinces madami. I love street food much too. They are more delicious and cheaper! But still need to consider their cleanliness in case got infected. Street foods to me are absolutely the best! They are so uncomplicated but yet extremelly tasteful! To know the country and people we must try their street food. It is the most adventurous thing to do for foreigners. I always love to try out every country street food. What a nice collection of interesting street food choices! I don't eat Isaw and Crispy chicken skin, but the others are a big yes for me. Never tasted kwek-kwek with cucumber before. I love street foods. It's just important to check how they handle their sauces as it can lead to communicable disease. Fried chicken skin and gizzard is nasty. LOL but sure yummy. I wouldn't mind to go venture on street foods. 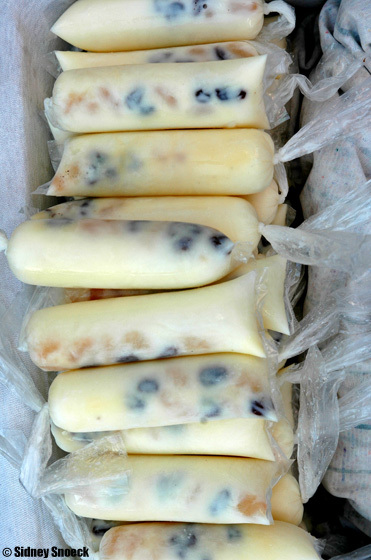 I loveeeee street food and these are so tempting aww!! Street can be good but it depends on where you are and where you buy it. 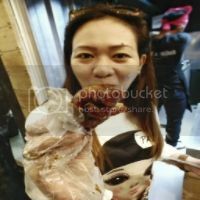 A family friend was poisoned by food she bought on the street and died from it. In the US, food vendors are licensed and checked. I would just say be careful. I love street food too because the meals are always fresh and prepared at the very moment of buying them, I love the care and attention, the personal attitude that the street vendors show. A great post! In Canada we do not have street food, but rather food trucks, which I think can be somewhat similar with just the locations differing I think it is all in how you approach it. People should b keep an open mind when trying new things. I love street food! I miss isaw and fishball so much. There's a show here in the US called "International Street Foods" and I'm still waiting for them to feature Pinas, they featured tons already and hope they get to our country someday. I don't really fancy street food but looking at your post making me change my mind.. They're just awesome! I understand the apprehension of people in general regarding street food. They take into consideration the trustworthiness of the one selling and how the food was prepared and is being handled. For the "suki" store, I wouldn't have second thoughts of eating street food. Isaw ng baboy is my favorite.